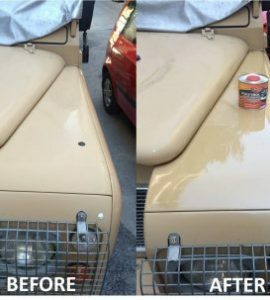 A customer recently sent us some great before and after shots of a project completed on their 15 year old Land Rover using Polytrol to restore the shine to paintwork on the exterior. It’s not a long and laborious job, quite the contrary! The customer simply cleaned the surface with soap and water, left it to dry and then used Polytrol to revive the surface. Using Polytrol couldn’t be easier, your first need to clean the surface using soapy water and allow it to dry (you can also use Net-Trol for cleaning). Next, you simply apply a generous layer of Polytrol with a brush or cloth, leave it for 10-20 minutes and then wipe off any excess to leave a revived surface. We would recommend that you work in areas that can be completed in 10-20 minutes to ensure even coverage. 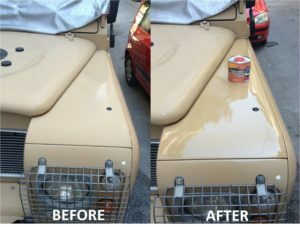 Polytrol is a deep penetrating oil which restores the original color and appearance of dull or tarnished plastics, gel-coats, metals and other surfaces. It penetrates the surface, re-wetting the pigments to restore their luster and color which has been lost through exposure to sunlight, rain and pollution and it also gives corrosion protection. It’s not only for use on faded plastics and paintwork either, it has a whole heap of uses. When used on tarnished metals, it brings back the shine and gives long-term protection against corrosion. Polytrol can even be used on fiberglass (GRP) making it perfect for such a wide variety of uses. It’s even perfectly save to use on children’s garden equipment so great for dealing with the sun-faded playhouse and slide! With such a wide variety of possible uses, we love seeing your Polytrol project photos, if you’ve done something interesting with Polytrol and you have some pictures to show what you’ve done, we’d love to hear about it and feature it here or over on our Owatrol Facebook page.